Marc Robidas is the newest RITZ guest blog contributor. Marc is an experienced road and track day rider who pilots a Ducati 798 on the track and a Hypermotard SP on the street. Let’s see what Marc has to say about group riding. I enjoy group rides. Each ride brings an opportunity to meet like-minded people and to discover new roads. Any group of people will vary in their range of skills. You know you’ve found a good group to ride with when no one feels they need to pick up the pace, and any reckless display of awesomeness is discouraged. Not long into the ride, I have a sense of the other riders’ skills. It might be easy to keep up. Or maybe the rider ahead is slightly more skilled; they become my carrot. Sometimes, I notice the gap growing between myself and the rider in front of me. There is mild guilt about creating a gap in the group of riders and the temptation to twist the throttle is strong. So off I go to close the gap. Wait, wait, wait! What’s going on here? Am I really “riding my own ride”? On twisty roads in particular, I savor the relationship between myself and the road with little or no influence from the other riders. When the road gets challenging, I let the gap grow sufficiently so the next rider is not an influence on my choice of corner speed. Don’t let pack mentality ruin your ride. Sometimes this means the next motorcycle is out of sight. Allowing the group to stretched out allows each person to ride in a way that feels comfortable. 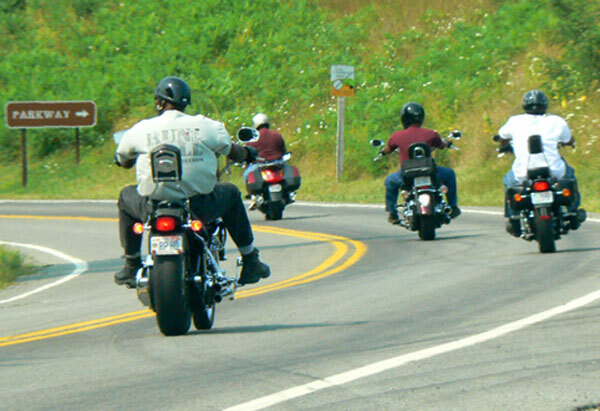 Speaking of comfort, an all day group ride can add 300+ miles on the odometer. From a cold morning start, hot afternoon and wet finish to the day, bringing the right riding gear will make every minute a treat, and minimizes dangerous distraction. The ride will undoubtedly be a mix of smooth twisties with pavement that has seen its better days. Although my bike’s suspension is on the firm side, it is adjustable. Softening the settings allows me to ride a full day in relative comfort. A pre-ride meeting makes sure everyone is on the same page. Communication among each group member is essential. A pre-ride meeting is important to describe the route and the expectations of the group leaders. 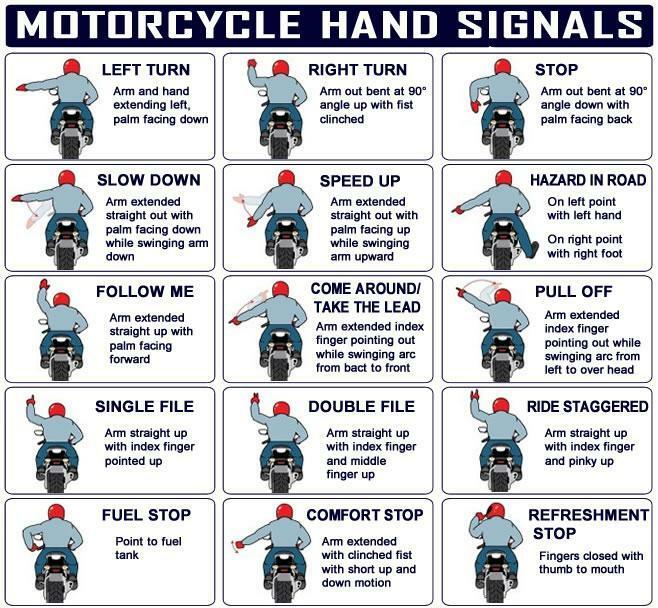 Any use of hand signals during the ride need to be explained. Arrive at least 15 minutes early with a full tank of gas and an empty bladder. And, don’t be that guy (or girl) who is late for the rider’s meeting and is then clueless about the day’s plan. Group riding essentials are covered in the MSF’s guide: click here for the group ride PDF, and below is a video from the MSF about group riding. Take a look. 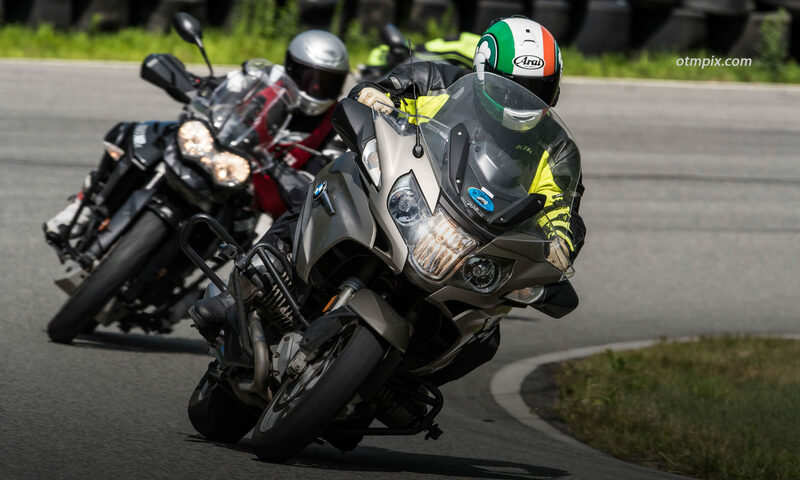 Group riding can be a blast, but it can also be quite dangerous if riders do not understand the idiosyncrasies of riding in a group. It’s also risky to ride with people who are not skilled. Be discerning about who you ride with and don’t be afraid to bow out if a particular group does not share your values of risk management. Here is an article that talks about the dangers of Peer Pressure.